When LGBT workers go to work each day, they want to be judged on their professionalism, their experience, their performance, and their ability to get the job done. By working hard, meeting their responsibilities and playing by the rules, they strive for a fair chance to achieve a piece of the American Dream. But Americans are shocked to learn that there is no federal law that explicitly protects workers who are lesbian, gay, bisexual and transgender from unfair workplace discrimination, and that in more than half the country—including states like Ohio, Missouri, Pennsylvania, Utah and Florida—such protections are also denied under state law. 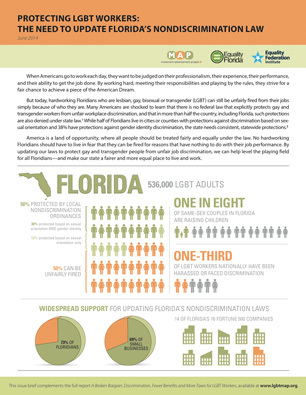 In Protecting LGBT Workers, a new series of issue briefs based on A Broken Bargain: Discrimination, Fewer Benefits and More Taxes for LGBT Workers, the Movement Advancement Project (MAP), the Equality Federation, and leading statewide LGBT organizations provide an overview of the unfair treatment faced by hardworking LGBT Americans who continue to lack essential protections against discrimination—and as a result, can still be unfairly fired from their jobs simply because of who they are.